Provide comfort for the family of Diane Wise with a meaningful gesture of sympathy. Mrs. Diane Wise, 70, of Charlotte, went home to be with her Lord and Savior on January 19, 2019. She was born to the late Robert and Louise Shields. She was a devoted wife, cherished mother and proud grandmother. Diane enjoyed spending time with her family. Her big smile and sense of humor will always be remembered. She was a member of Northside Baptist Church who served God with a passion for sharing the Gospel of Jesus Christ with others. Diane was preceded in death by her parents, Robert and Louise Shields of Charlotte and brothers, William Clyde Shields and Lesley Shields. Her immediate family includes her husband Frank Wise, son Ronnie Wise and wife Dana of Mount Olive, daughter Shelly Earle and husband Mike of Mooresville, brother Dale Shields and wife Kris of Charlotte, seven grandchildren and one great grandchild. Visitation will be held on Tuesday, January 22 from 2:00-3:00 with service starting at 3:00 at Northside Baptist Church in Charlotte (333 Jeremiah Blvd.) Graveside to follow at Gethsemane Memorial Gardens. Dr. Scott Vail, Rev. Dale Shields, and Rev. Ronnie Wise will be officiating the service. 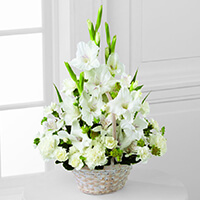 To send flowers in memory of Diane Wise, please visit our Heartfelt Sympathies Store. Frank, Ronnie & Shelly... So very sorry! Diane was most definitely a wonderful Christian lady that I was privileged to call a precious friend! She will be GREATLY missed!! Much love and prayers for her family and friends! It is with our heartfelt sympathy. She will be greatly missed. James Baxley and Crystal Derosia purchased the The FTD Eternal Affection Arrangement for the family of Diane Wise.